Pro Tip: "Demon WP packs are easy to use, just mix them into water. Mix well in your sprayer, and use the finished solution within a couple of days. Demon was a good German Roach killer, but they seem resistant to it now. Gel and powder baits are the best choices for the German Roach. Cyper WSP ( packets) have the same label as Demon WP but are more economical. Both Demon WP and Cyper WSP are classified as a long-term residual insecticides." Demon WP Insecticide kills large roaches, spiders, crickets and more. Demon WP Insecticide has been a number one seller for many years due to it's convenience of use. Simply drop the packets in the envelope in water (they dissolve). Demon WP Insecticide contains cypermethrin 40% and works well for a variety of insects, lasting up to 3 months. Demon WP Insecticide, with cypermethrin 40.0% kills large roaches, spiders, crickets and more. It can be used inside or outside. Demon WP Insecticide in its envelopes has been a number one seller for many years due to it's convenience of use. Simply drop the packets in the envelope in water (they dissolve). Demon WP Insecticide works well for a variety of insects, lasting up to 3 months. A gallon of finished of Demon WP mix usually completely covers a 2,000 to 2,500 sq. foot home. Demon WP 1 lb tub has been discontinued by the manufacturer. Cyper WSP ( packets) have the same label as Demon WP, but are more economical. For the small German Roaches, choose a high quality roach bait like a href="http://store.doyourownpestcontrol.com/invict-gold-roach-gel-bait">Invict Roach Gel . German Roaches have grown immune to most insecticides like Demon WP. Childen and Pet Safe ?Yes, when used as directed. Keep off of wet surface until they dry. Demon WP packs are easy to use, just mix them into water. Mix well in your sprayer, and use the finished solution within a couple of days. Demon was a good German Roach killer, but they seem resistant to it now. Gel and powder baits are the best choices for the German Roach. Cyper WSP ( packets) have the same label as Demon WP but are more economical. Both Demon WP and Cyper WSP are classified as a long-term residual insecticides. ants, boxelder bugs,carpenter ants, centipedes,cockroaches, crickets,firebrats, millipedes,silverfish,scorpions,spiders,wasps and certain other insect pests. Demon WP leaves a white powdery film that is especially noticeable on dark surfaces.Use D-Fense SC Insecticidetoo avoid visible residues. We sell only professional pest control products. Demon WP Insecticide is not available in home improvement centers or hardware stores such as Home Depot, Lowes, or Ace Hardware. An another product called: * Cyper WP has the exact same label, but is less expensive than Demon WP. Demon WP and Cyper WP are extremely toxic to fish. Do not apply directly to water or to areas where surface water is present or to intertidal areas below the mean high water mark. Wet liquid contact with skin may result in transient tingling and reddening of the skin. Remove contaminated clothing and wash before reuse. Always have dependable equipment to avoid leakage. They mail product to me. I am a senior woman n can do it myself. Been doing this over 10 years. And affordable. This is the best pesticide on the market, it is do it yourself. And it works wonders. Highly recommend. I live in a very rural part of Texas. Scorpions were my main target and it wiped them out quickly. I spray both inside and outside my house and shop. I repeat every 3 months and have nothing but praise for this product. Easy to use. Works great for carpenter bees and spiders. I use it every year. Zero bugs!! This stuff is incredible. We used it for small kitchen roaches Which can be very resistant. Demon WP keeps me bug free! Hands down the best product for roaches, ants, spiders and all things creepy crawly. I spray it in crevices in the whole house and repeat every three months or so. I saw dead ones at first. After three treatments nothing. Saved hundreds of dollars on pest control. No smell. A slight white residue but think I didn't add enough water. This stuff is amazing! We had so many Box Elders (hundreds of thousands every year) we thought they would carry off the house. Last year in spring I tried this stuff and we've hardly had any since. Works exceptionally well for them! I just ordered this stuff it came in two days,today (08/5/2017) I just used 1 envelope in a gallon sprayer I wasn't even done spraying the house before roaches started falling dead.i will write a further review in the next couple of days when I see how effective it works. This stuff works really well on roaches and spiders.saw roaches around trash barrels and had lots of cellar spiders.sprayed barrels and inside and outside of foundation about a month ago.just started to see a few cellar spiders now and nothing on trash barrels yet.I plan on spraying a couple times a summer from here on out.get yourself good gloves.Cheap latex ones are barely good enough. Exactly as represented, on time and a decent price. Will order again..
Works amazingly for the price! I have been using this demon pa for over five years. It is the best I have ever used. I have told so many about this product. I've been using this stuff for years. I spray twice a year, Spring & Fall. The only bugs I see in my house are dead ones. This stuff is amazing, I can't say enough good about it. Buy It, It Works. This product is the best I've ever used. After two days I have not had any more problems.i treated inside and out. Demon WP is the best insecticide I've ever used. It kills Hobo Spiders DEAD, DEAD, DEAD! It's even taken care of our Hobo Spider problem better than whatever the professional exterminators we hired were using. And they were charging us $60.00 per month, June thru September. Demon WP is deadly on earwigs too. This is a bad year for them here in SE Idaho. But sweeping a dozen or so dead earwigs of our front porch (which I sprayed with Demon WP) is sure a lot better than having live ones in our house. Recommended by a friend. Does the job right, and saves me $ - DYI. Demon WP has worked effectively for me for years. I apply twice per summer which is the frequency that works for me to assist with keeping bugs under control. Very quick shipping and great price! I have an uncle that owned a pest control business. After trying the stuff at home depot, Lowes and Walmart I decided to give him a call. He immediately recommended Demon WP and said that is what he used for years without any complaints. I've used it now for about 5 years. I recommend this to anyone that wants to save money doing their own pest control and use something that really works. after signing a lease to a new rental home we discovered it was infested with roaches!!! This product combined with igr and gel bait eradicated them!!! I will forever be a customer of this company! Customer service is great! 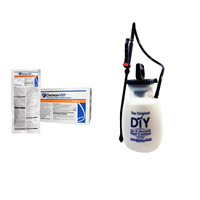 I have purchased demon wp before , but it was purchased from diy pest control in the store, my order purchase on-line was received in a timely manner, and i am very pleased, I have not seen any bugs in months, thank you so much. This product is the best. Been using it for almost 15 years, never failed to do the job. Better than any pest control service I ever used. Have been selling others on it for years, also. Great product! It even kills pesky ants in mounds around the yard! Ordering is easy and reliable. Customer service is excellent for questions regarding products. Also great for spraying around your porch for wasps. It continues to work for months. Wasps don't go near an area that has been sprayed, and if they land on that area, they soon die. used this stuff once 2 years ago for a infestation of roaches. I also combined it with a IGR and a gel bait. Well now it is 2 years after and I have not seen a bug in FOREVER....well we are about to move so I had to order some more for the new house just in case. Great product and I am just ready for my next shipment. Infestation of small crickets in vacant lot next to my business; they were invading nightly causing havoc to my customers. Sprayed a 1 foot band on a curb between me and the vacant lot and next morning there was a carpet of dead crickets measuring 10 ft x 40 ft. Residual effect kept killing and now no cricket problem. Demon- aptly named- and thank you! Well went on to doing my second treatment of Demon WP. This product is by far really effective. First started with the two packets in one gallon. I had a scorpion proplem in my new home. These things were just about everywhere. Ever since my first treatment i have yet to see one! I've went around doing the second treatment and its once again great! I does leave a white residue behind so becareful of furniture or items you don't want sprayed!!! All in all well worth it! Very useful comprehensive insecticide for indoor and outdoor use. Long lasting effect indoors. Particularly effective against roaches. We've been using Demon WP for all of our bug problems both in the South and now the Midwest. We've been using it for well over ten years. It is the best out there! If you are like me, I don't like to see bugs in my house, use this product. No need to pay for pest control services when you can do it yourself. And it works much better and lasts longer than what they use. Demon WP was just what the doctor ordered! Have not seen a scorpion since we sprayed. Thanks so much. Over the past 17 years we have been fighting box elder bugs and Asian lady beetles among a variety of other random insects that like to frequent our 145 year old home. Last year a colony of carpenter ants took up residence in a 200+ yr old maple tree and soon expanded to other trees and our home. We have tried everything to win this insect battle and after ordering and applying Demon WP we only saw one bee in our attic window. We consider this a miracle, if we had only known about Demon years ago it would have saved us many hours of grief and a lot of wasted money. Thank you. we decided to move north to western maine . and also cluster flies, went to the box stores we bought and tried several things which to be honest had no affect. after doing some research online we decided to buy demon wp. as directed. I sprayed around the foundation, all my eves and around the roof line. worth every penny in my book great product. Great product I reecomend it. Have been using this for a few years for ants really gets rid of them I would recommend it for anyone to use. I have been using this product for years. It does a great job and saves us a bundle on exterminator costs. more . Demon will kill them.The best! Great product for ant and spider control. Convenient and easy to use! I've been using Demon for years and it works! I don't use anything else. great product i highly recomend demon wp! Been using Demon for over 30 yrs. Still the best stuff I've ever used. We have used this product for years and are very happy with the results. Only bugs we see are DEAD ones. of mounds up to 12 inches in diameter and 2 gallons for larger mounds. Been using on a friend's recommendation, when I had a problem with roaches. I remembered a friend never had a problem and also used on his mother's home, that I had been to many times, so I asked what he used. Now, my brother, sister and a friend wouldn't use anything else. My brother lives in Florida, always had a problem with the large roaches flying in from outside, and I was afraid to stay there. After I sprayed his house inside and out, the only roach you will ever see, if any, is a dead one. Yea Demon! Bugs come out from hiding and die. This product is very good for that. Prompt delivery by Do-it-Yourself is great. We have used Demon WP for years and would encourage anyone to use it as a self pest control product. I finished application of 1 gallon of Demon WP a few minutes ago and the giant nasty american cockroaches that plague Georgia are running away from the house in droves. I have a cedar sided home with a partial crawlspace and the roaches have been horrible this year. I'm finding the twitching little b@$t@rds all over the basement and outside in the pinestraw. I will definitely buy Demon WP again. I was very pleased and surprised to find the little $10 pack I purchased contained multiple application packets as I was expecting only enough for one application. DIYPC shipped my purchase the same day and it arrived within 48 hours! Awesome product, Awesome Customer Service! When we moved into our new farm house we quickly discovered that we had a big wasp problem. I mean we had thousands of them. We tried everything without success and finally we stumbled across Demon WP. Not only did it take care of the wasps in kills but also spiders, ants, you name it. I had a gallon of the home defense bug spray and used it two weeks ago. Saw some dead roaches around. Tried this on a friends recommendation and had triple the roaches on their backs. Will have to wait to see how long it lasts. The other raters make me hopeful. My dad 20 years ago told us to get Demon wp to kill the scorpions in our garage when we moved in our first new home together. We've used this stuff literally around our house, not inside, just outside around the perimeter of the home and we never have any bugs of any kind to deal with, EVER. Use it and you will be hooked on the quality and dependability of it. Sprayed this around our house 2 months ago and have had no Scorpions in our house. Use to have dozens every year. I started using this back in the 80's I was working in the pest control field when I first started using it and used it for just about everything from one time treatments to monthly treatments. It worked great on every type of insect from flying to crawling. I would recommend that you swap up every few years in Pesticides to make sure the insects in your area do not get immune to any specific type. This product does leave a slightly off white residue on wood floors and trim. The odor is very slight and only lasts for a day or so. Still its a lot better than oil base pesticides. It doesn't work for German roaches, however. I have been using Demon for quite some time. it was first recondmended to me for an infestation of fleas. It worked great indoors and outdoors but if using indoors it does leave a residue. I was introduced to this product by a friend. I was having an issue with american cockroaches. The roaches were seen scurring across the baseboards and even climbing the walls. I sprayed as directed all around my house, the next morning I woke and there were over 10 large dead bugs. Slowly over the next few days I upon waking I noticed less and less dead bugs. Now, I use the product as maintenance. It has almost eliminated my infestation. I also use it to exterminate fire ant mounds that appear in my yard, I just take the sprayer and soak the mound, it's almost an instant kill for the whole nest. Works well on spiders, too! Tried a number of products but have never found anything that works as well as Demon WP on BOX ELDER BUGS. I used this product on a black widow infestation. Mixed using the instructions on the package for killing spiders, sprayed on a Saturday, went back under the house on Wednesday and everything under the house was dead. Only gripe is the white residue. I have been using Demon WP for several years now. I spray my outdoor balcony for hornets, and spray inside for centipedes. I haven't seen bugs in years. Yeah!!! For years i have had spiders on the north side of my house and have tried everything. Had to wash house every two weeks. Sprayed once and have not had spiders for two years. Think i will spray again but i am not sure why. I have use the product in the past and I am very, very happy to have tried it and very happy to say that it is a out standing product. I were introduced to this at an local garden center. I have been using this for a week this is a great product. Have been using this product for years, works great and I save a bundle not using an exterminator. I read on the website to use this product for German roaches and was quite ready to be rid of my "new roommates." This did nothing to them. It killed the babies that were so tiny you could barely tell it was a dead bug but had no effect on any others. Works well on the ant piles in the yard though and as a preventative for other bugs around the home. Completely useless on my roach problem though. I just ordered a bait called invirt and I'm hoping that will kill them. This stuff kills all the creepy crawlies! Nothing harder to kill than brown recluse spiders. You can read why on your own. I captured a brown recluse spider in my outdoor garage and put it in a baby food jar after spraying some of this in the jar. 15 minutes later it was dead. This stuff also kills everything else in the state of Alabama bug wise. This stuff is FANTASTIC! I usually buy it at the feed store, but, our feed store closed down. I only have to buy it every two or so years, spray around the house and no bugs. It's been about two years so I got it here, cheaper, with free shipping. Not a bug in 3 years! I battled ants in my kitchen and bathrooms and was beginning to see small roaches and an assortment of other pests in my garage. For three years now my house and garage have been bug free. This product is virtually odorless, non-staining and very easy to use. Used for carpenter ants and scorpions. Fantastic. Collateral action on other insects and spiders. Well worth the money. I have been buying this product since the mid 90s and found it to work great. Friends and family that I introduced to it have agreed it is awesome. I have ordered Demon WP several times in the last 10 years and am very satisfied with how it kills my spiders Do It Yourself Pest Control has helped me consistently. It last a long time and theprices are always good.